Bullying is both psychological and physical. As teachers, our plates are full during the school day. So how can we safeguard our classrooms and ensure the safety of our students? 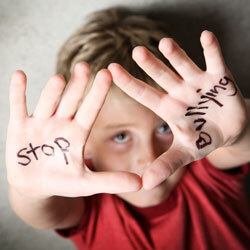 One of the ways is to empower our students against bullying. Bullying prevention expert and presenter Fabian Ramirez was victimized by a bully in middle school and uses that experience to talk to students about how to deal with bullies. His videos and lesson plans are directed to empower both students and teachers.He offers training to help schools become bully-free zones. Fabian says what you don’t talk out, you act out. Most bullies are dealing with internal issues that they project on others. In fact, he says studies from the Secret Service show that 71 percent of school shooters were bullied, threatened, attacked or injured themselves. Most were loners and got picked on during school. Venting, Fabian says, helps students unleash emotions. He urges students to vent and defines venting as releasing or transferring your emotions through words. 1. Analyze: See where you are at and work through that with the person you are venting with. Sometimes it’s really not that bad. 2. Assume the best: Have a follow-up conversation with the person who is acting like a bully. Maybe you heard it wrong. Sometimes people don’t mean what they said. 3. Don’t take it personal: It’s about them and not you. Don’t think something is wrong with you. 4. Act upon your feelings: Don’t bottle up feelings. Find a release. Draw. Journal. Get into sports. 5. Find one person to trust to talk to: Don’t try to find affirmation with multiple people. Trust that one person and share your negative emotions through words. Learn more about Fabian as he presents February 5 at Harris County Department of Education. Register for his workshop offered through our Center for Safe and Secure Schools. Ecomet Burley, a 26-year administrator, is the new leader of the Center for Safe and Secure Schools. Established in 1999, the Center provides school safety and security training for school districts in greater Harris County. Burley, the former superintendent of La Marque ISD, resides in Pearland with wife Frances, an elementary school principal. Education, Burley insists, is the primary and native language spoken in their home.